Scald the milk and butter in a large pot. Alternatively, you can heat the milk and butter for four minutes on high heat in the microwave, until it is very hot. Then transfer it to a pot on the stove. Keep hot over medium heat. In a separate bowl, mix cornmeal, flour, and salt. Stir in molasses. Thin the mixture with about 1/2 cup of scalded milk, a few tablespoons at a time, then gradually add the mixture back to the large pot of scalded milk. Cook, stirring until thickened. Temper the eggs by slowly adding a half cup of the hot milk cornmeal mixture to the beaten eggs, whisking constantly. Add the egg mixture back in with the hot milk cornmeal mixture, stir to combine. Stir in the sugar and spices, until smooth. At this point, if the mixture is clumpy, you can run it through a blender to smooth it out. Stir in the raisins (optional). Pour into a 2 1/2 quart shallow casserole dish. Bake for 2 hours at 250°F. Let the pudding cool for at least fifteen minutes, then serve using a large serving spoon. Top with whipped cream or ice cream, if desired. This classic cold-weather dessert is warm, rich and creamy—and wildly simple to make. 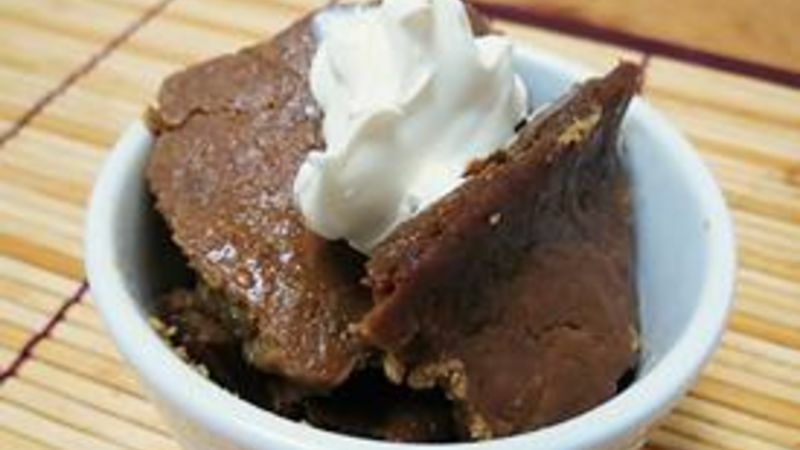 A quick stove-top dessert, this Cornmeal-Molasses Pudding recipe comes together in minutes, thanks to the thickening powers of cornmeal and eggs. It bakes in the oven, slow and low, yielding an elegant yet homey finish to any meal. Serve it in pretty bowls, topped with a dollop of whipped cream as the finale of a classy dinner party, or in mugs with cold vanilla ice cream, while watching a classic film. To start, scald the milk and butter in a large pot. To save some time, you can also heat in the microwave for 4 minutes on high until it is very hot. Transfer to a pot on the stove, and keep hot over medium heat. Now you can preheat the oven to 250 degrees F. While it’s warming, mix cornmeal, flour, and salt in a separate bowl. When combined, stir in molasses. Thin the mixture with about 1/2 cup of scalded milk, a few tablespoons at a time. Gradually add the mixture back to the large pot of scalded milk. Cook, stirring until thickened. Temper the eggs by slowly adding a half a cup of the hot milk cornmeal mixture to the beaten eggs, whisking constantly. Add the egg mixture back into the hot milk cornmeal mixture and stir to combine. Stir in the sugar and spices, until smooth. If the mixture is clumpy, you can run it through a blender to smooth it out. Stir in the raisins (optional). Pour into a 2 1/2 quart shallow casserole dish. Bake for 2 hours at 250°F. Let the pudding cool for at least fifteen minutes, then serve, with a large serving spoon. Top with whipped cream or ice cream, if desired.